The Powell & Pressburger Appreciation Society’s 2003 reunion for devotees of Michael Powell and Emeric Pressburger’s ‘A Canterbury Tale’ took place at Chilham on Sunday August 31. 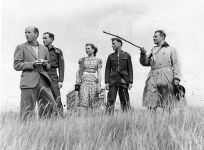 Sixty years earlier, on that very day, the first takes for the memorable ‘scene in the long grass’ were made on Chilmans Downs, Chilham, and Sgt John Sweet of the US Army joined the film unit. 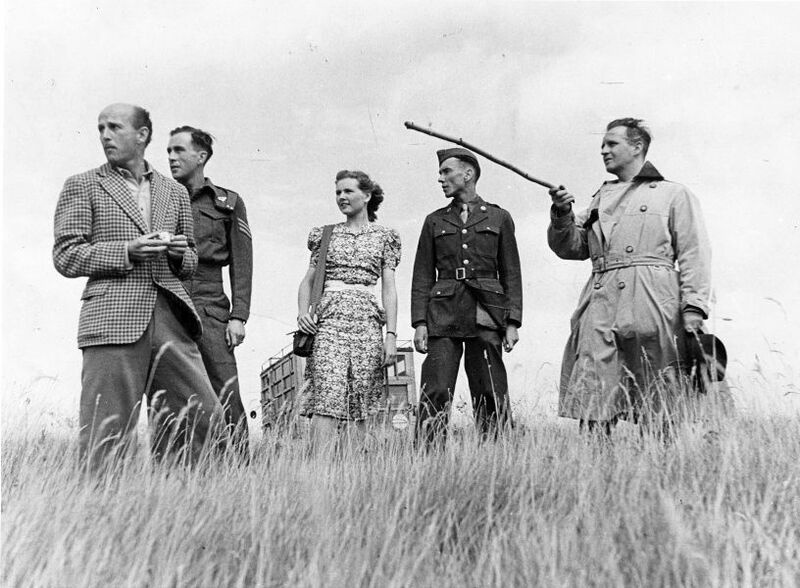 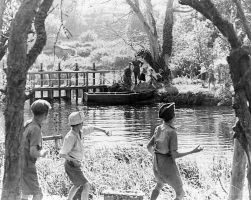 The pictures above show (left) Sheila Sim (now Lady Attenborough) and Eric Portman on what many of us call 'the enchanted hill'; (centre) the 'Powell pilgrims' enjoying a re-enactment of the scene; and John Sweet (second right) with Michael Powell, Dennis Price, Sheila Sim and Eric Portman on Chilmans Downs in 1943. 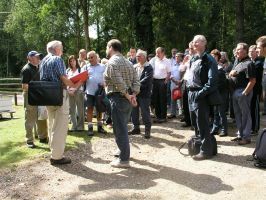 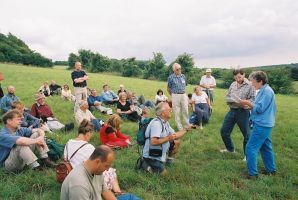 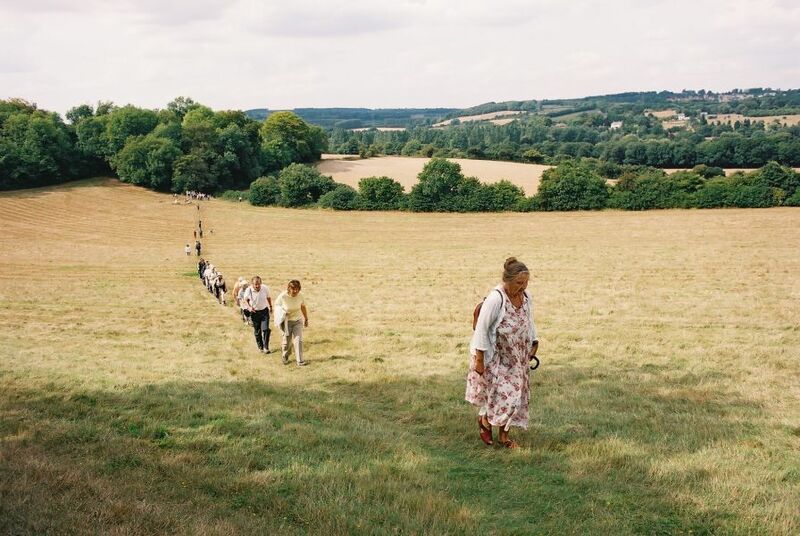 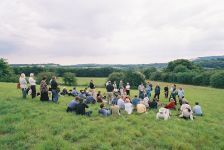 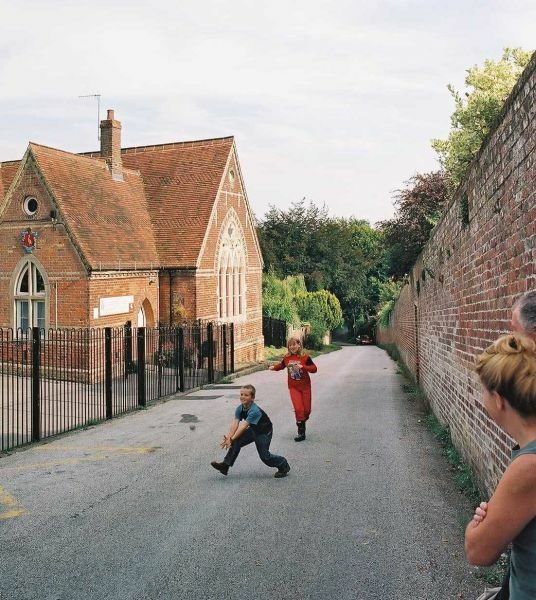 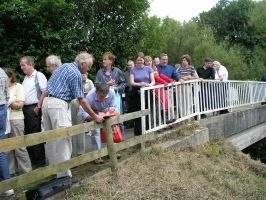 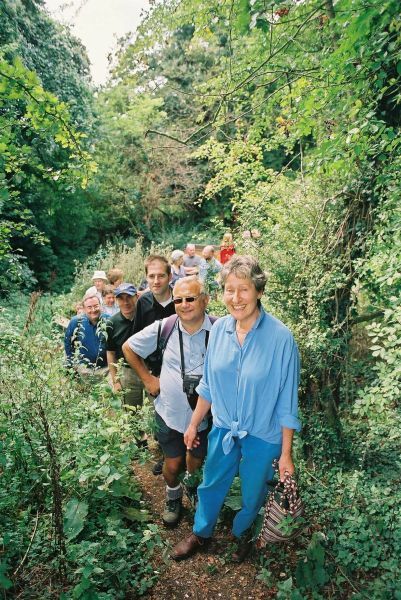 More than 50 people, some from as far afield as Australia, met at Chilham Station when the midday trains from Ashford and Canterbury arrived (to cries of ‘Chillingbourne, Chillingbourne.’) and enjoyed a three-mile walk to key locations. 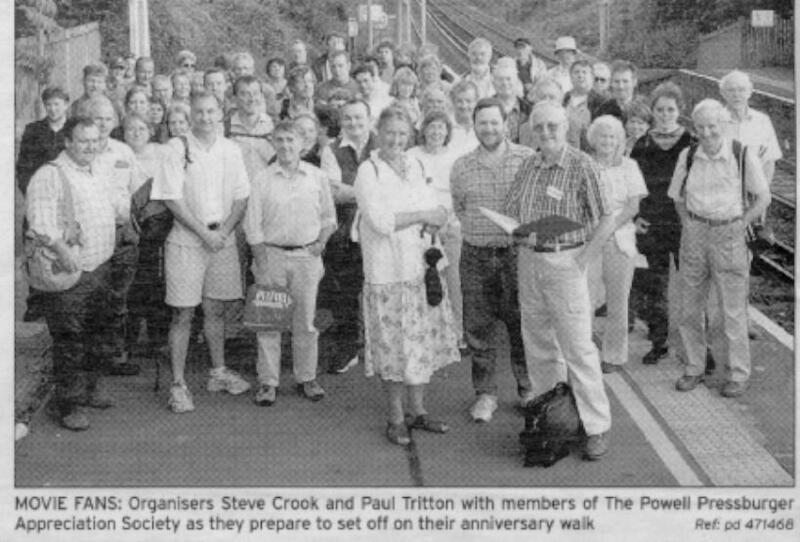 Along the way several late arrivers joined the group, bringing the total number to more than 70. 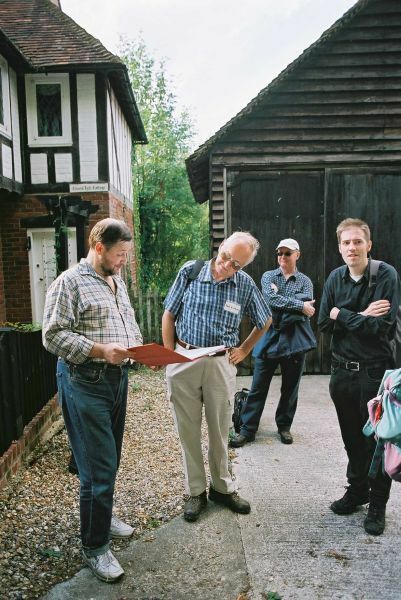 Their guides were Steve Crook, founder of the Powell & Pressburger Appreciation Society, and Paul Tritton, author of A Canterbury Tale - Memories of a Classic Wartime Movie. 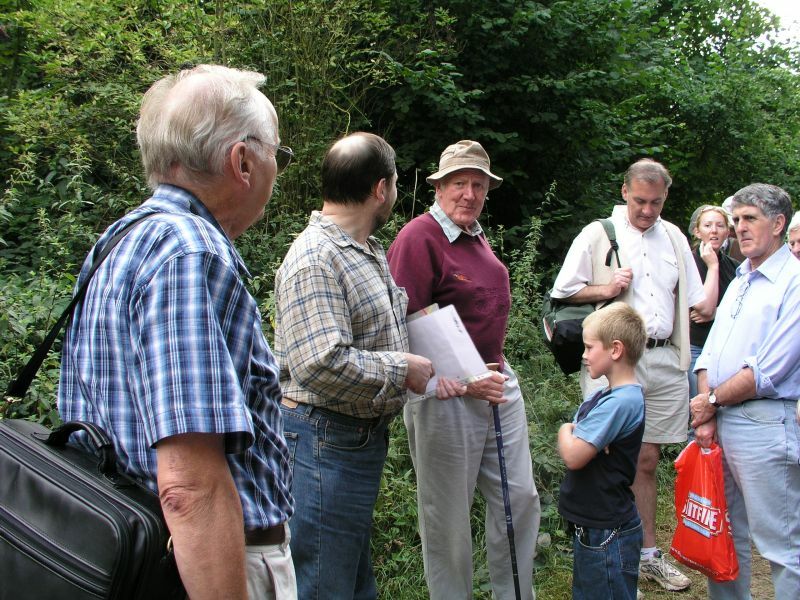 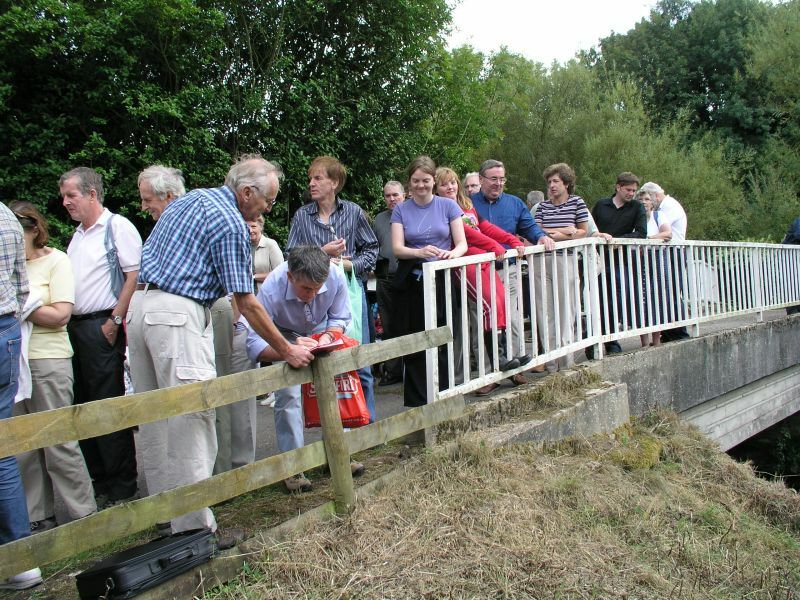 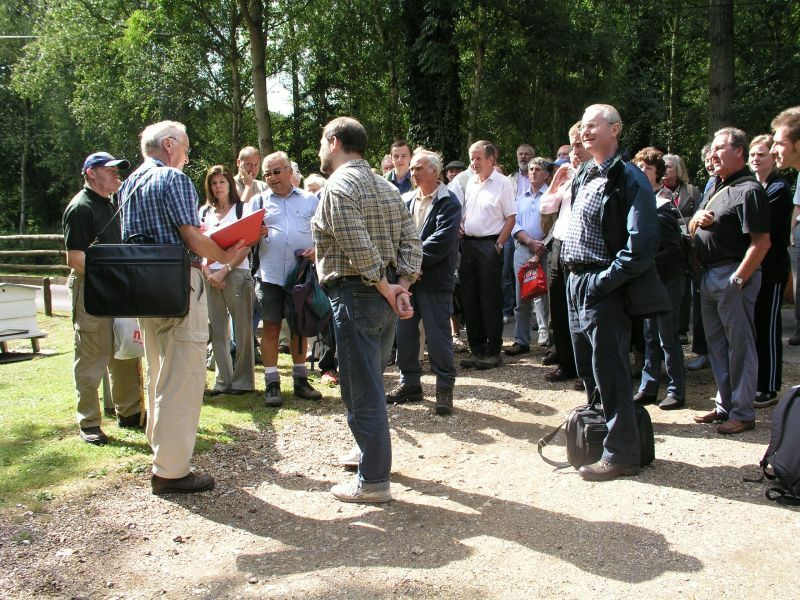 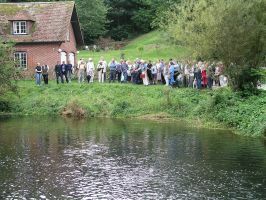 From the station, the group followed the waymarked 'Stour Valley Walk' to Chilham Mill and the location where the gangs of Chillingbourne boys lead by Terry and Leslie enjoyed a battle on the river. 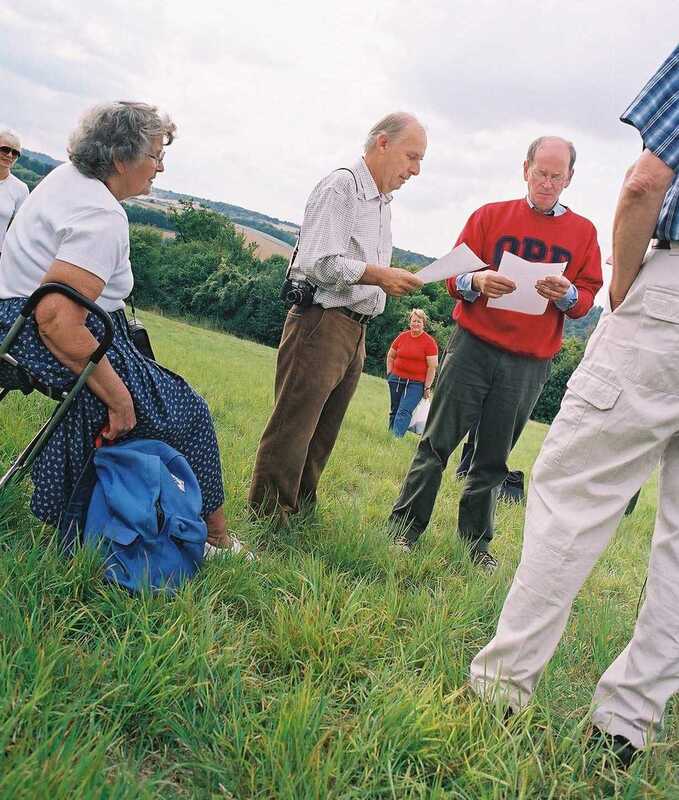 Jim Smith (centre), owner of Stile Farm – in whose cornfields some of the action was filmed – led us along a path he had cut through the undergrowth to help us find Julliberrie’s Grave. 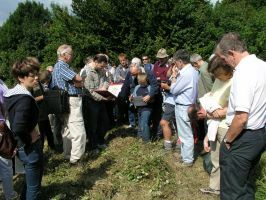 He explained the changes in farming methods he had seen during his farming career spanning 50 years. 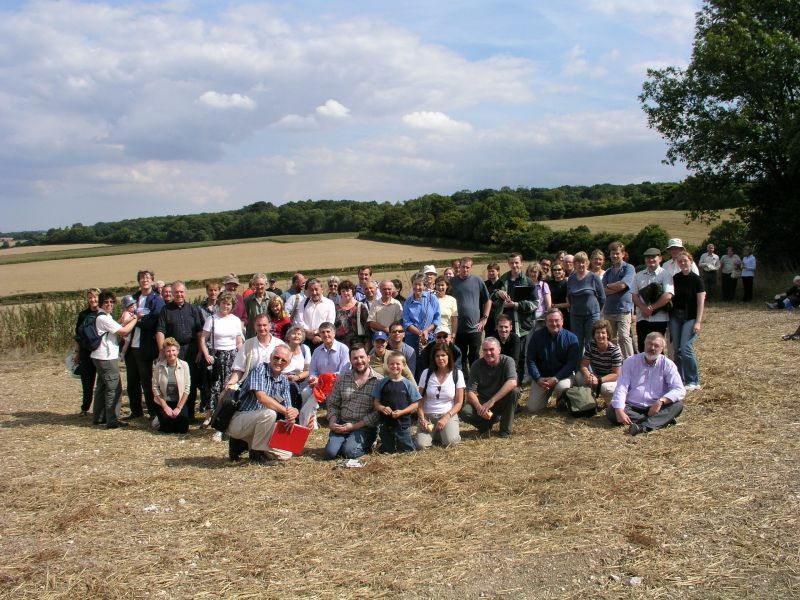 For example, far fewer labourers are seen at work in the fields today, especially at harvest time, because now a combine harvester operator can complete in a day and a half a job that took several men a week or more. 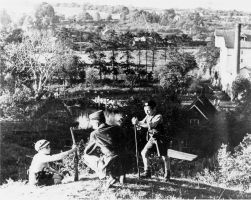 Cornstacks too (seen in a least one shot in A Canterbury Tale) disappeared from the landscape many years ago. 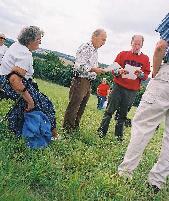 Steve and Jim's son Jonathan presented a playlet of the pow'wow on Julliberrie's Grave. 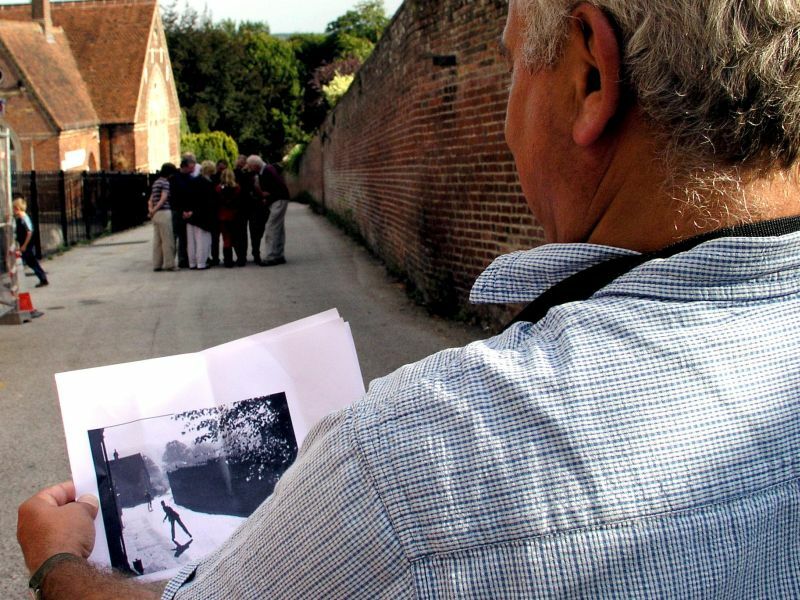 Note how trees now obscure the view of Chilham Mill that Powell's cameras captured 60 years earlier when John Sweet, Leslie (Len Smith) and Terry (Jimmy Tamsitt) had their pow'wow on the same spot in 1943. 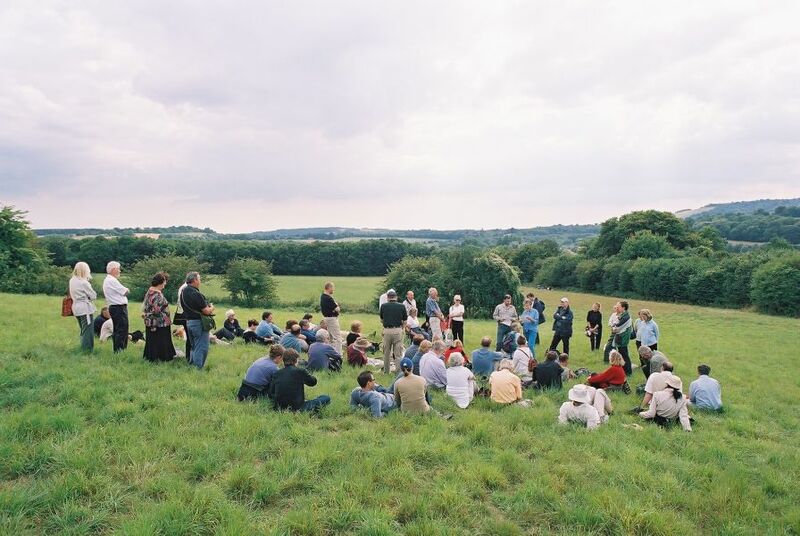 From Julliberrie's Grave we climbed to the top of the downs, then rested to admire one of the Stour Valley's many noble prospects and enjoy a well-earned rest and a picnic. Immediately behind the group above are the cornfields across which the Universal Carriers lurched before Peter Gibbs and his platoon ambushed Alison as she drove her horse and cart along the "Pilgrims' Road"
During our picnic, John Clark from Canterbury recalled how, 60 years earlier, as a Chilham schoolboy, he watched the scenes in the wheelwrights’ yard at Shottenden and the 'battle' at Chilham Mill being filmed; and later appeared with his mother in the crowd scene in Mercery Lane, when The Band of the Buffs and the regiment of soldiers marched to Canterbury Cathedral. We then walked up to Old Wye Lane, where the 'ambush' scenes on the Pilgrims' Road were filmed. 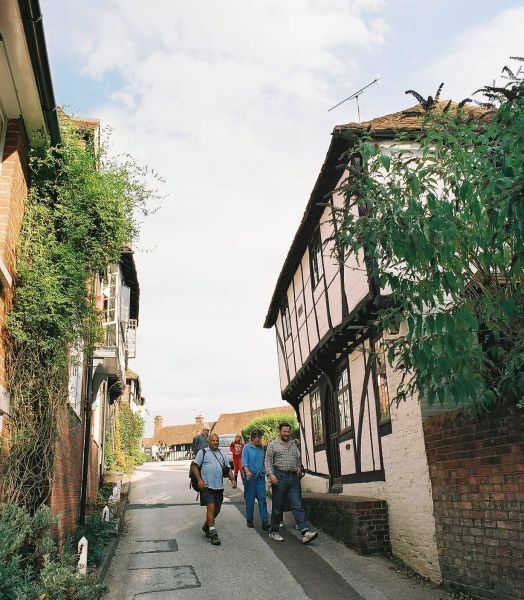 The real Pilgrims' Road, aka Pilgrims' Way, is in fact on the opposite side of the valley. Here, the group is seen walking to the top of the Rye Field to one of the camera positions chosen for the 'ambush' episode. The footpath they are following corresponds to the track followed by two Universal Carriers as they drove away from the camera. 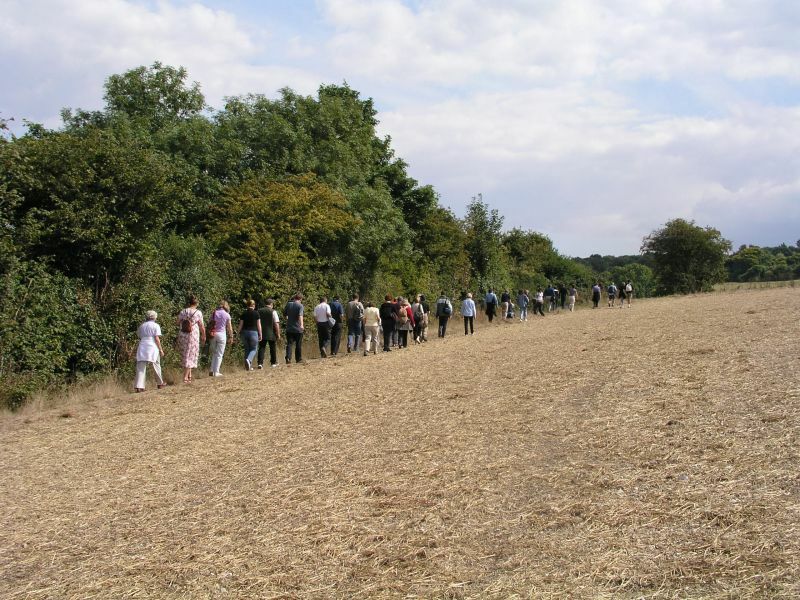 Other Carriers were filmed driving across the field in the middle distance. 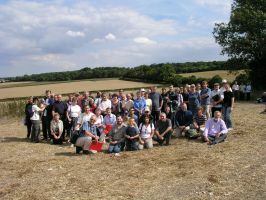 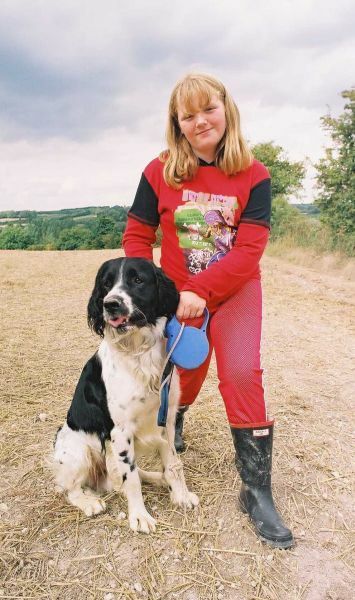 The group at the foot of the hill is at the corner of Old Wye Lane where Alison and her horse and cart were seen in a long-shot after the ambush. "Pilgrims to Canterbury often receive blessings." "Do you think even a visit to the agricultural committee can be the instrument of a blessing?" 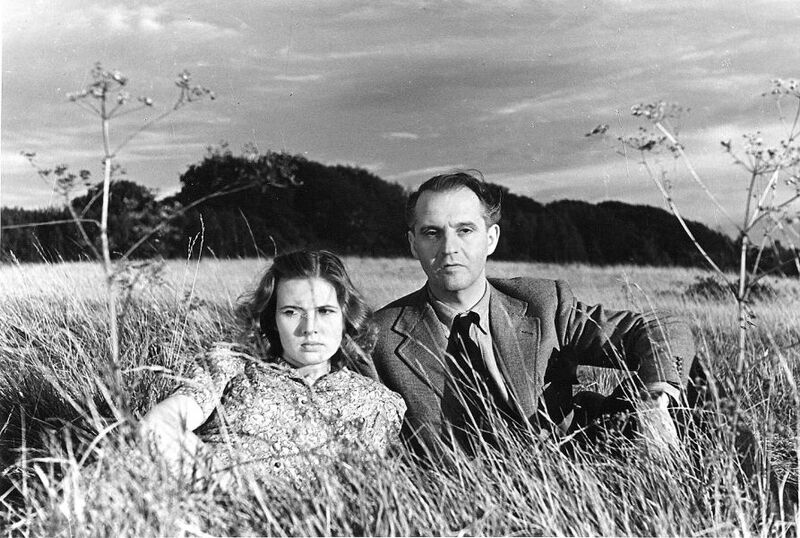 In the field where, 60 years earlier, Sheila Sim and Eric Portman looked across the Stour Valley in the 'scene in the long grass' Steve Crook and Helen Lawson re-enact the dialogue. 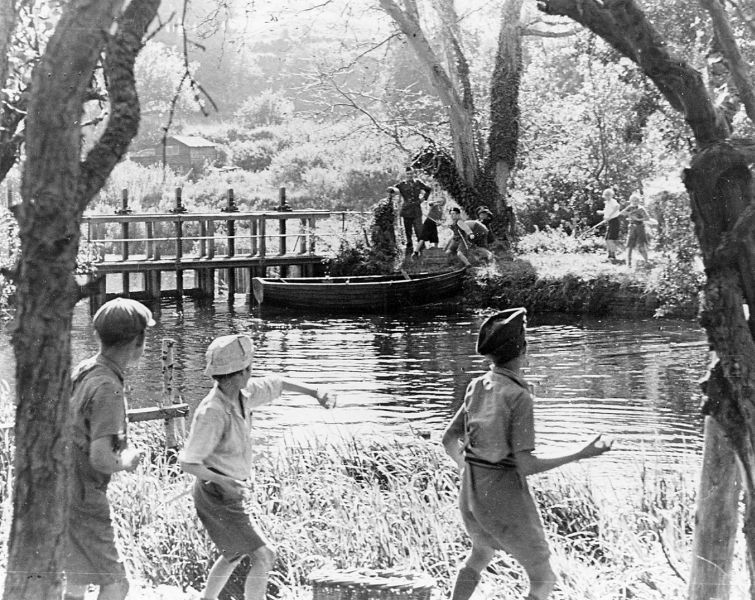 "I'm going to Canterbury and I ain't no river." 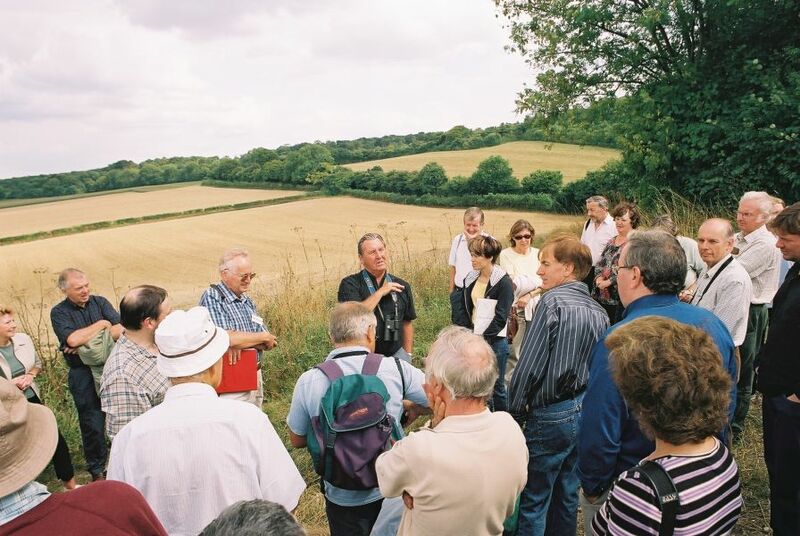 Richard Fraser (right) as Sgt Bob Johnson and David Manners as Sgt Peter Gibbs, re-enacted the scene in which the two sergeants picked blackberries and admired the 'noble prospect' of the Stour Valley and Canterbury Cathedral. 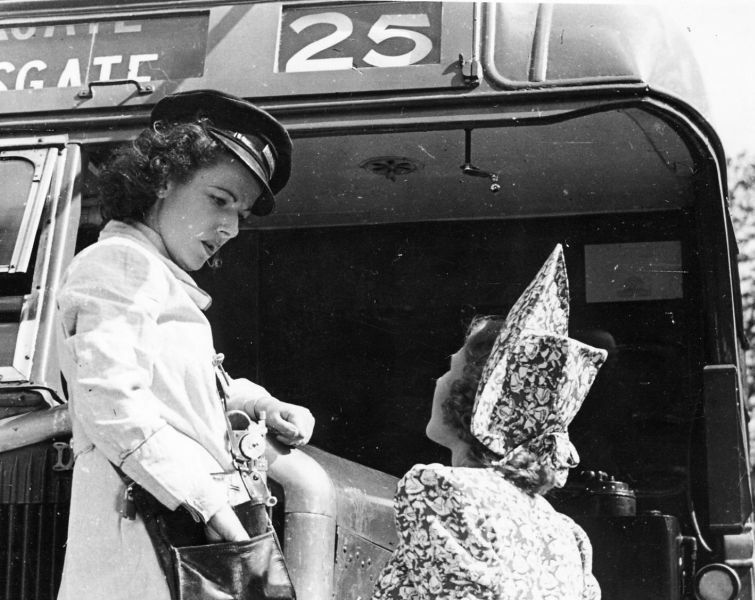 Watching from the wings on the left is Win Tamsitt (widow of Jimmy Tamsitt who played Terry in A Canterbury Tale). 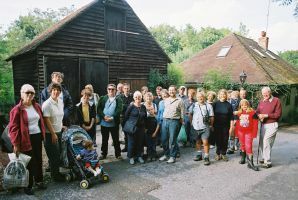 We then retraced our steps and headed for locations in Chilham village, pausing near the mill to sign greetings cards to Lady Attenborough and John Sweet. 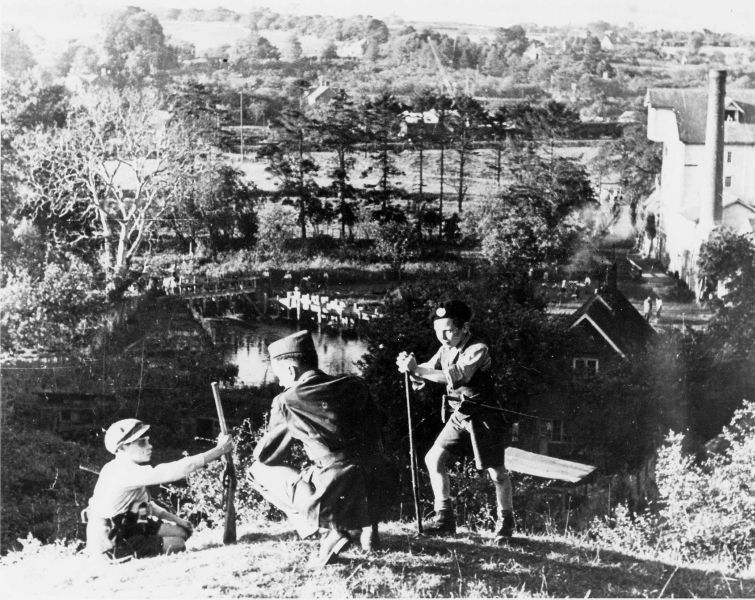 ... and then gathered on School Hill to re-enact the scene in which Bob and Peter played Catch! 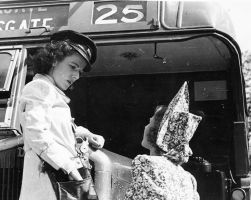 after leaving the salvage collectors' store. 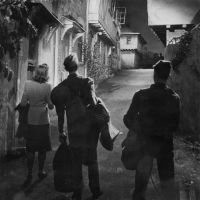 On Taylor's Hill we admired the narrow street and old buildings that inspired Michael Powell's set designers when they created Charing Street for the scene in which Alison, Peter and Bob chase the glueman. 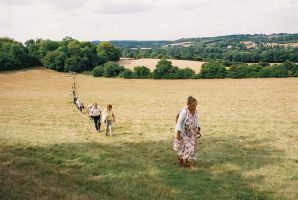 No visit to 'Powell country' would be complete without a stroll along part of the actual Pilgrims' Way (as distinct from the lane to which he gave that name for his locations in the film), so the walk ended where the Pilgrims' Way runs past Chilham's St Mary's Church. Here, Steve Crook quoted from Thomas Colpeper's lecture: "There are more ways than one of getting close to your ancestors ... follow the Old Road, and as you walk, think of them and the old England ..."
The collection made during the walk in aid of Kent Kids Miles of Smiles raised £197.80 and this will help pay for an extension which is being built at Footprints Holiday Respite Home, Canterbury. 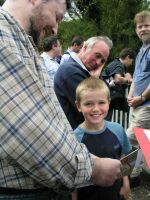 Our thanks to everyone for their generous donations. 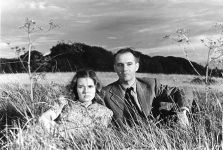 This was a Powell & Pressburger Appreciation Society event. Note: If you click on any of the pictures you will see a larger version of the picture. If you want to see the original, full size picture, then put "/Original" in front of the last '/' in the address bar.